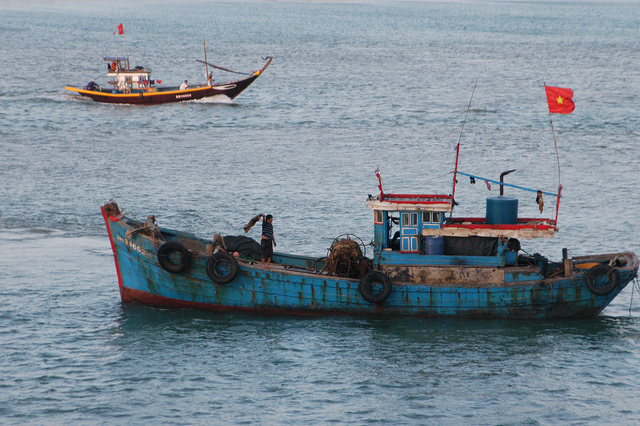 China has shifted from salami slicing to ramming in the South China Sea. The latest apparent collision … suggests China won’t moderate its activities in contested areas of the South China Sea, despite a broadside of criticism from senior Australian, Japanese and US officials at the Shangri-La gathering of military leaders and defence ministers. It’s time to accept that what China is doing is a full and official expression of Chinese policy. We’re long past the point where the Chinese system should be given some sort of leave pass because of suggestions that China isn’t a unified actor—a perspective that argues China’s ‘crisis management’ machinery consists of the PLA creating the crisis and the Chinese Foreign Ministry handling the outcry. As a description, that view has its attractions, but as an explanation it absolves the China polity of responsibility for its rash, ramming policy. We should take China at its word, in proclaiming itself a big and important power; and such powers are responsible for what their military and their coast guards and their energy agencies do in the name of the state. If the South China Sea is Asia’s cauldron as well as Asia’s Mediterranean, as Robert D.Kaplan writes , then the heat in the cauldron is up again. Kaplan’s Cauldron book has been out for a few months, offering an excellent set up for what has happened in the last few weeks as Vietnam is rammed. In surveying the ASEAN players, Kaplan judged, ‘It’s all up to Vietnam’. He has a quote from ‘a top US official’ on ASEAN’s positioning: ‘Malaysia is lying low, Brunei has solved its problem with China, Indonesia has no well-defined foreign policy on the subject, the Philippines has few cards to play despite that country’s ingenious boisterousness and incendiary statements, Singapore is capable but lacks size’. Good luck, Vietnam. On such matters turn to the master, Professor Carl Thayer , particularly his analysis of Vietnam’s strategy . ASEAN can’t abandon Vietnam to its fate the same way it stepped back from the Philippines last year. Accepting that ramming is official Chinese policy, endorsed from the top, what can ASEAN do? Southeast Asia needs to shift its response to China away from a futile policy of trying to negotiate an agreement with Beijing. Whether by slicing or ramming, China is out to create more ‘facts’ proclaiming its sovereignty. No Chinese appetite exists for any multilateral deal. Beijing thinks it erred in agreeing to the Declaration on the Conduct of Parties in the South China Sea and it’s not going to compound that mistake by agreeing to a Code of Conduct (COC). The COC process has led to divisions within ASEAN and divisions among ASEAN’s claimant states. China’s assertion of ‘indisputable sovereignty’ over the South China Sea and its recent unprecedented aggressive assertion of sovereignty utilising military vessels with unsheathed weapons and military aircraft, is now the major impediment to managing the maritime commons in the South China Sea. The Thayer solution is for ASEAN to turn away from the pointless effort with China and negotiate an agreement within ASEAN—a Code of Conduct for Southeast Asia’s Maritime Commons. The ten countries of Southeast Asia would resolve territorial and maritime disputes with each other, using as a model the recent agreement between Indonesia and the Philippines demarcating maritime boundaries in the Celebes and Mindanao seas. The proposed COC for Southeast Asia’s Maritime Commons would enhance ASEAN’s unity and cohesion, promote regional autonomy and ASEAN’s centrality in the region’s security architecture. Just launching the process would change the tone of the argument, not least by putting ASEAN back together again. China will almost certainly keep ramming, but it would be running into an ASEAN response based on unity, negotiation and legal agreement. That would be a significant response to Chinese force. Graeme Dobell is the ASPI journalist fellow. Image courtesy of Flickr user Em and Ernie .